The title of this post reminds me of the essays we were asked to write in Primary school — A visit to the museum, a visit to the seashore or a visit to the post-office. My mother would promptly open our beloved bible- Navneet Prakashan Essay book and make us copy down the essay word to word. Sometimes we would even learn it by rote as very often these horrible essays would form a part of the unit or final exams and of course I had to get full marks! I almost always did specially in Primary school while mum still ruled! Sorry I couldn’t help digressing a little bit but now coming back on track. I visited the wet market today and for non-Hong Kongers, a wet market is a local market in Hong Kong where fresh fruits, flowers, vegetables, poultry, seafood and meat are sold, all under one roof – an old Hold Kong tradition kept alive before the reign of the supermarkets. 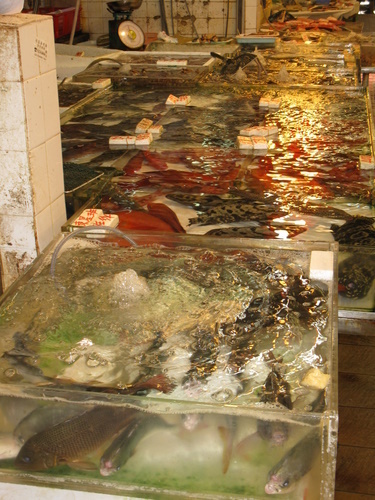 It is similar to any local fish or vegetable market in India, where I am from, which is filled with varied kind of noises and smells. Except that this one sells everything together so depending on which part of the market you walk in, your senses would be assaulted differently. Of course my favourite section is the flower, fruit or the vegetable one with relatively better things to see and smell. The row upon row of green leafy vegetables gives you an indication of why the Chinese have ever-youthful skin. All the vegetables and fruits are stacked nicely and look absolutely fresh, almost as if picked a couple of hours ago. In fact this ”freshness” is the key to the success of the wet markets. As I move across the market, I come to the seafood section where I hover around looking at the different kinds of fish trying to figure out which ones looked remotely close to the ones I was used to seeing in Mumbai. But I guess fish look very different when they are alive! Most of them are kept in big buckets of water or small aquariums, crowded together, with barely any moving or breathing space not that it matters much as within a few minutes a hand goes down to pick up one, who gives a bit of a lifeless struggle before she is plopped down. Fresh till her last breath! In Mumbai, the lady of the house loves to give a hard time to the local fish monger who has to walk up three or four stories to deliver his produce, arguing that his fish is not fresh or that it is too expensive. So is this the freshness we are looking for? Well I prefer not to be labelled murderer so I just point out to the already dead (maybe 30 minutes ago) fish on be the table, quickly dish out the money and walk away. Now moving to the meat section. Thankfully out here I don’t have to worry about watching anyone die, as the pigs are already slaughtered and are hanging by hooks neatly in a row, sorted according to their body parts. So for example you have legs, followed by knuckles, ribs, necks, shoulders, then heads and in some places I have also seen tails! The smell of fresh blood and flesh is unbearable for me though so I quickly move on ahead to pass the poultry section which again has nothing alive but dead chicken hanging de-feathered from their thin necks. You can also get black and yellow colour chicken out here which I have never tried. 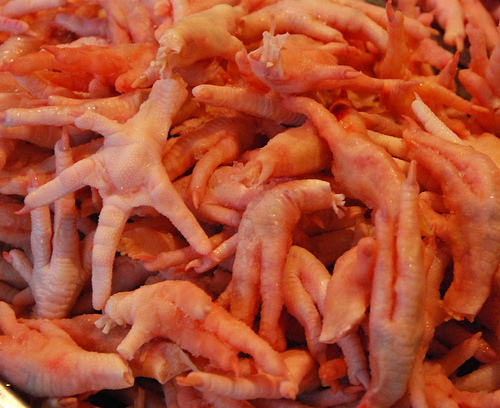 But the main delicacy of Hong Kong is chicken feet which are loved by kids and adults alike! So far, so good. 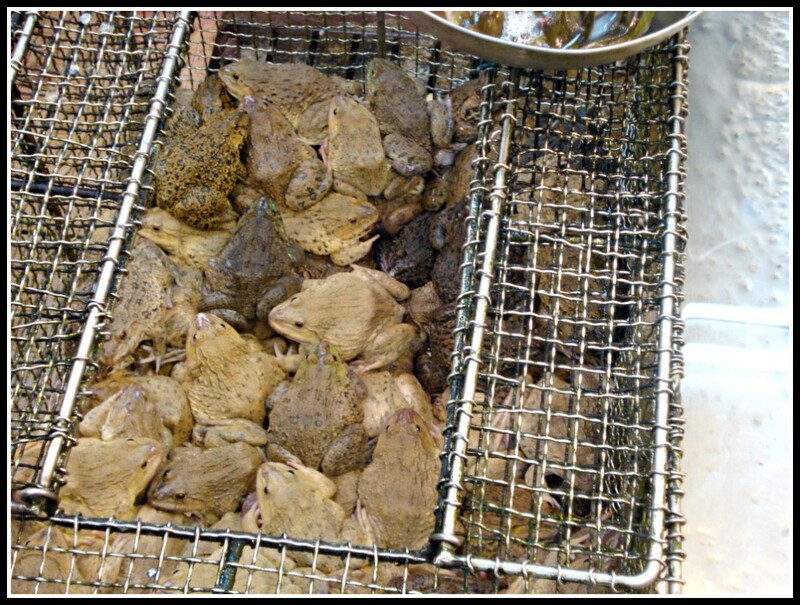 But what caught me off guard the first time I visited a wet market is the sight of hundreds of frogs, all ALIVE and all just put together in a big plastic container with a net on top of their heads, to obviously prevent them from jumping out. My sons were quite fascinated by this sight and every time we passed the wet market, they would want to go inside and touch the frogs! There were crabs too trying to crawl out of their tightly bound ropes, and turtles – ALIVE again! 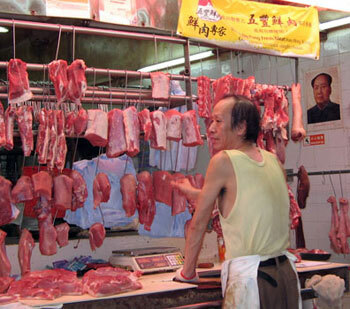 I wonder how human beings can get away with eating all these creatures! I mean I know I am a preferred vegetarian so I will obviously frown at all these sights. I am not against people eating any of these, it’s their choice, their culture, but my point is can’t they just sell them dead? Will it be so very ”stale” to do that? Been here 10 1/2 years and never been to the wet market. Don't think I could bear it! Thanks for your perspective Reena, and try taking your daughter along too, sure beats the dead zoo that we have in HK!